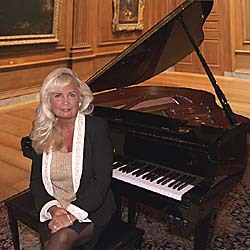 Chicago Pianist, Kathie Nicolet, has earned the reputation as one of Chicagoland's most respected corporate entertainers and Chicago wedding musicians since 1983. Highly regarded for her professionalism and memorable artistry, she sets a standard of excellence for musicianship and integrity. This Chicago Pianist connects with her audience - giving a part of herself to each and every listener. Whether performing Beethoven's exquisite "Moonlight Sonata", the sophisticated, romantic, "Unforgettable", or favorite selections of Gershwin, Frank Sinatra, Elton John, and Duke Ellington, music is designed for your successful event. Looking for a jazzy, fun cocktail hour? Quiet ambience for an elegant or romantic dinner reception? Music conducive to conversation? Have a request? Look no further. Born and raised in Park Ridge, Illinois, the daughter of a Lyric Opera Tenor who premiered at the Civic Opera House in "Don Giovanni", Kathie was introduced to the piano at 5 yrs. old. Earliest recollections were accompanying her Dad while he practiced for his upcoming appearances! Formal lessons had begun at 7 and continued for 12 years while having studied with some of the finest teachers in the Chicago area culminating in Fort Collins, Colorado, with Professor Irwin S. Diebel - Chairman of The Music Department of Colorado State University. An award-winning performer, Kathie took 1st place honors in a talent competition sponsored by The Kiwanis Clubs of America for her rendition of the classic movie theme, "Exodus" - This incorporated her love for classical music as well as her ability to cross over into popular - inspired by the piano duo of Ferrante and Teicher. She also placed in the Illinois Teacher's Guild Competition at the young age of 9 in Chicago. Having performed her artistry for hotels, lounges and restaurants beginning in 1983, now Kathie chooses to focus on corporate/social events. Working with some of the finest upscale facilities in the Chicago area, she is in high demand for her consummate professionalism, true brilliance of her musical sensibilities, and elegant demeanor. Kathie Nicolet is a 1999 Inductee Into TODAY'S CHICAGO WOMAN Magazine's "100 Women Making A Difference For Professional and Charitable Contributions"